Don't know about you, but I LOVE beer! Growing up in Israel, there was no drinking age and my dad would come home for a mid-day break to have his lunch. His favorite drink in the parched Israeli summers was a cold beer to wash down the dust from his bus ride and to accentuate my mom's delicious homemade food. Often, I would join him for lunch and he would share his beer with me. Mind you, I was in 4th grade... So, you can say that I've had a beer habit for quite a long time... Nothing quite quenches a thirst on a hot day like a frosty beer, right? 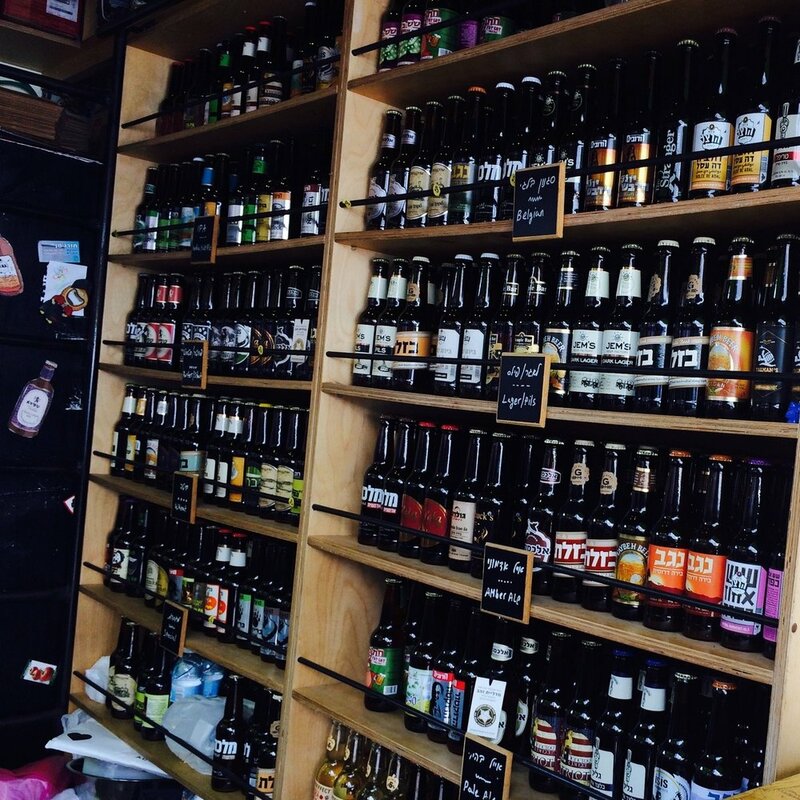 Even in tiny Israel you can find a treasure trove of flavorful, masterfully crafted beers. This is a kiosk in the Tel Aviv Carmel market: carrying only local Israeli micro-brews. So, obviously - I am always quite happy to explore new beers, especially when they are locally produced and had won national recognition. On a warm, autumn evening, along with our friends John & Linda, we ventured to the tucked away location off of HWY 36 to explore Bent Brewstillery in Arden Hills, MN. I had reserved a tour for 4, which came with a flight of beer. Can't go wrong with that! Colin, with whom I exchanged several phone messages, met us at the tap; friendly, smiling and helpful. The flight was poured and before long we were seated down to absorb the friendly and cosy atmosphere of the place. Didn't take long for our yummy samples to disappear... Layered flavors, surprising depth and richness - and we were hooked! Our flight of beer; L to R - from Light to dark - Yum! Next came, the highlight of our visit - Meeting Bartley Blume, or as he is reffered to on the Bent website: Lord of Brews & Booze. Yes, he is the Owner/President/Head Distiller - a man of many talents, who is an electric engineer by trade with a past in the space industry. His travels into the brewing rabbit hole began with a home brewing kit that was a gift from his wife. As he jokingly says: "she regrets it to this day, everyday..." Can't be too serious, since she is listed as the Chief Financial Officer and the Manager of All That’s Done and Not Done on their website. Bartley impressed us with his passion for his craft, his humor and knowledge and above all, his commitment to the quality and integrity of his product. The big surprise for me were the spirits; I arrived ready to taste and enjoy the beer, and I did! The spirits are the product of the same creative thinking that leads to unique flavors and interesting, delicious beers. Their gin, Gunner Ghost, for example, has rich botanicals, created by the addition of herbs and spices such as lavender and coriander, to name a couple. Oh, yes, it is Navy Strength - 114 proof. You'll have to read about that on their website... They even make an Irish-Style Poitín called Bent Anchor, which Anchor Fish & Chips in North Minneapolis uses to make their decadent and salty-rich Poitín Poutine. Obviously, we headed there when our visit was done to sample that. It did not disappoint! We tasted the spiced rum, Stormbringer and the Winter and Coffee Stormbringer, which are cream versions of the original. All I could think of was "what can I make with this, other than obviously, Cocktails???" Ooohh, boozy bread pudding, coffee cream caramels, or caramel sauce, spiced rum cake, drunken brownies... My head was spinning! So - to my surprise, instead of going home loaded with newfound beer, I ended up going home with Gunner Ghost gin, Stormbringer spiced rum and the Coffee Stormbringer. Thanks, Bartley! We will be back! !